Are you looking for a flexible online bank account for easily managing your money in complete security? Choose the Trustcom Financial Personal Account. You will not have to demonstrate your financial strength or physically go to the branch: choose the solution that best meets your needs between Basic, Standard and Premium, and request your account directly from the PC or smartphone in just 5 minutes. The account will be immediately available. 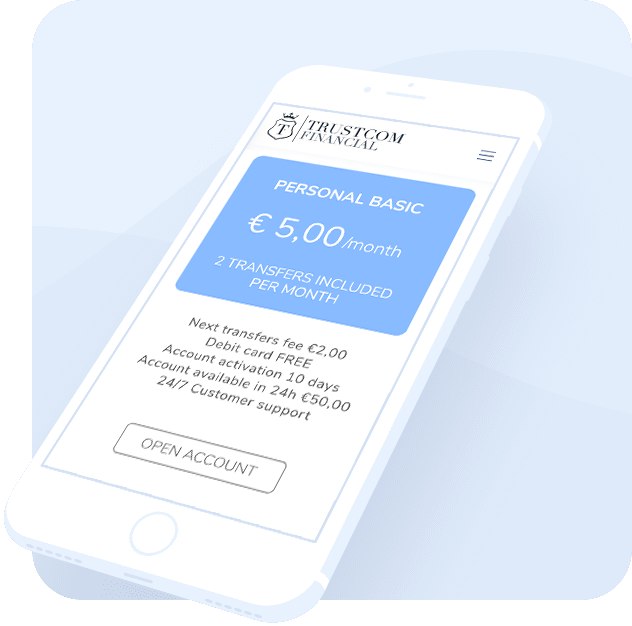 With the opening of the account you will receive for free the associated card, with a maximum withdrawal limit of € 5,000 per day and € 150,000 per month. Discover all its advantages in the dedicated section. All our current accounts are 100% guaranteed by Bank of Lithuania. The entire amount of money on your account will always be available to you and will not be used as an investment, traditional practices of Italian banking institutions that provide funds up to a maximum of € 100,000. The multi-currency online bank account allows you to buy online and transfer money to different countries in real time with no currency exchange costs. In addition, we guarantee 1-day quick bank transfers if made in Europe, without receipt fees and the highest security level with SWIFT payments. Often requesting assistance becomes a long and complex procedure. In order to provide a complete and quality service, we guarantee the availability of our operators through online chat from 9.00 to 24.00, 7 days a week, for any type of transaction, whether linked to the card or the account, with lower response times at 3 minutes. Why choose a Lithuanian account? There are many advantages of opening an online bank account with a Lithuanian banking institution: there are no management costs, tax or other types of costs that could affect your savings, as in Italy with the property tax. Moreover, any kind of unexpected seizure or credit of an eventual insolvency by the Italian State cannot be directly deducted from the current account, without the authorization of Bank of Lithuania. To obtain this authorization, it is necessary instructing a foreclosure process with international rogatory, according to the laws of Lithuania.